A place where you would want to come back. We try to keep a cozy, home-like atmosphere where you can relax and chill out after your long day of traveling. In our 100-year-old “Machiya”(an old traditional Japanese house) we only have Japanese style beds “Futon”(sleeping on tatami floor), shared bathrooms, shower rooms and a kitchen, also free Wi-Fi which can be used anywhere inside. All guests receive a Map for the first night. Bicycle rental 500 yen per day. In our cafe on the first floor, you can choose to sit alone and enjoy your moment, or share the long table with other travelers and share your fun experiences from your trip. We provide breakfast set from 8:30 am for 2 hours, at 400 yen. Please pay at the lodging facility which you are staying. ・We can keep your luggage at reception before Check-In and after Check-Out. One of the best hostels I ever stayed in! One of the best places I ever had the luck og beeing at. Incredibly friendly staff, who takes their time for a chat with you, helping you wherever thy can. Anything on equipment you can wish for. Comfortable futon, pillow and blankets. Slept really well. At the bar/common space you get a guest discount. 10/10. Would stay there again at any time. Very friendly and nice staff. Authentic Japanese interior and very clean. The location is perfect and it is very convenient to get around with the bikes of the guest house. I liked it a lot. Really nice staff :)! They give very good recommendations! The Hostel has a very nice atmosphere. The japanese style beds are comfortable. The walls aren't very thick, so there is some noise in the evening and at night, but nothing one can't live with! Would visit again! A very nice hostel, with traditional Japanese style rooms. Very friendly staff. Would stay here again anytime! 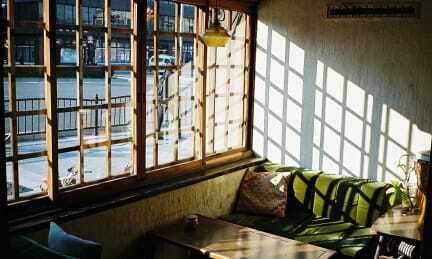 Very nice vintage-style guest house with extraordinary atmosphere. Had a wonderful time staying here. This is the perfect place to experience the real and traditional Japan. 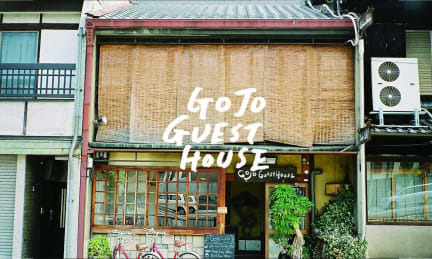 There is probably no better place than this guesthouse in combination with beautiful Kyoto. The location is good, you can go to a lot of places by foot and for farther places you can rent a bike (500 Yen per day) to explore the city. Breakfast is great, coffee delicious and they even offer soy milk. They give really good recommendations for food, bars and places. I will come back for sure!